This morning at Apple's annual September event at the Steve Jobs Theater in Apple Park, Jeff Williams took the stage to announce the Apple Watch Series 4. The new Watch lineup boasts larger and thinner chassis, more than 30% larger displays with rounded corners, a breakthrough ECG sensor, and more. This is the first major change to the shape of the Watch's enclosure since the debut of the original Apple Watch, but thankfully Apple has maintained compatibility with existing watch bands. The new models will be sold in 40mm and 44mm varieties, each size 2mm larger than the 38mm and 42mm of previous generations. Stainless steel and aluminum varieties are offered as usual, but it looks like we've seen the end of the "Edition" Apple Watch line. On the software side, the larger Apple Watch models are launching with a swath of new watch faces. Many of these faces take advantage of the new increased screen size by allowing a greater number of complications than we've seen on any face before. According to Apple the entire operating system has been revamped to take advantage of the new screen with its curved edges. These changes will ship in watchOS 5 on the new Series 4 Watch. There's no word yet on whether all or any of the new faces will make appearances on older models of Apple Watch – they have not been included in any watchOS 5 beta builds thus far. As mentioned above, the Apple Watch Series 4's new enclosure comes in 40mm and 44mm sizes. The exact measurements for the 40mm Series 4 are 40mm height by 34mm width by 10.7mm depth. 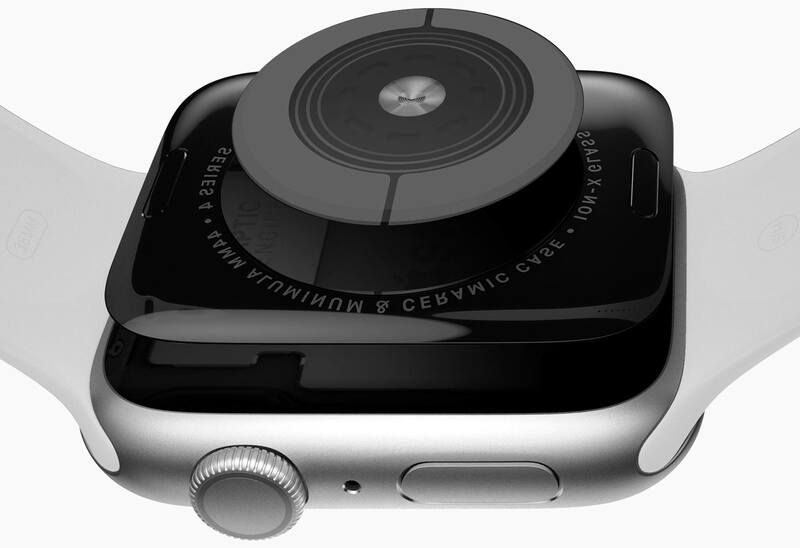 In comparison, the Series 3 38mm Apple Watch measured 38.6mm height by 33.3mm width by 11.4mm depth. The 44mm Series 4 dials in at 44mm height by 38mm width by 10.7mm depth, contrasting with the 42mm Series 3 model's 42.5mm height by 36.4mm width by 11.4mm depth. That makes both new models around 6% thinner than their predecessors. Jeff Williams called out on stage that the new Apple Watches have less total volume than their corresponding Series 3 models, despite the increases in width and height of the chassis. The screens on the Series 4 line have been pushed a little bit further toward the edges, although I still wouldn't quite call them "edge-to-edge" displays. Rather than rising to points, the corners of the displays are now rounded so that they can push against the physical corner boundaries of the new devices. Apple claims their goal was to make the new screens 30% larger without making the enclosures themselves noticeably bigger than previous models. We'll have to wait to get our hands on some actual Series 4 devices to determine the degree of success they had in this regard. The Series 4 Apple Watch include a brand new Apple-designed S4 processor. The S4 is a dual-core, 64-bit System in Package (SiP) chip, and Apple claims that the Apple Watch is the only product in the world to run entirely on a SiP. Performance-wise, the S4 is up to two times faster than the Series 3's S3 chip. The Series 4 models are also equipped with new speaker hardware which is up to 50% louder than before. The devices' microphones have been relocated to the right side (opposite the speaker) in order to reduce echo and make phone calls come through more clearly. The back of the Apple Watch Series 4 is made from black ceramic and sapphire crystal. Both materials allow radio waves to pass through them, enabling improved cellular activity since signals can now freely penetrate both the back and front of the device. The most evident change to this year's Apple Watch may be the redesigned case, but the improvements go much deeper than that. The mechanism behind the Digital Crown has been completely re-engineered to provide haptic feedback and to enable the device's ECG sensor. As you scroll the new crown you'll feel haptic clicks which help you place your position in the interface more precisely. The Digital Crown is 30% smaller overall, but Apple says they've packed 21% more components into the smaller package. While they don't go into detail on exactly what that component breakdown is, part of it is the new titanium electrode built into the crown's top. This electrode pairs with another electrode built into the bottom of the Series 4's new sapphire crystal back. When you place your finger over the top of the crown you form a closed circuit between your finger and the wrist of your other arm – where the back electrode is making contact. The new technology is then able to generate an ECG, or an electrocardiogram, within 30 seconds. 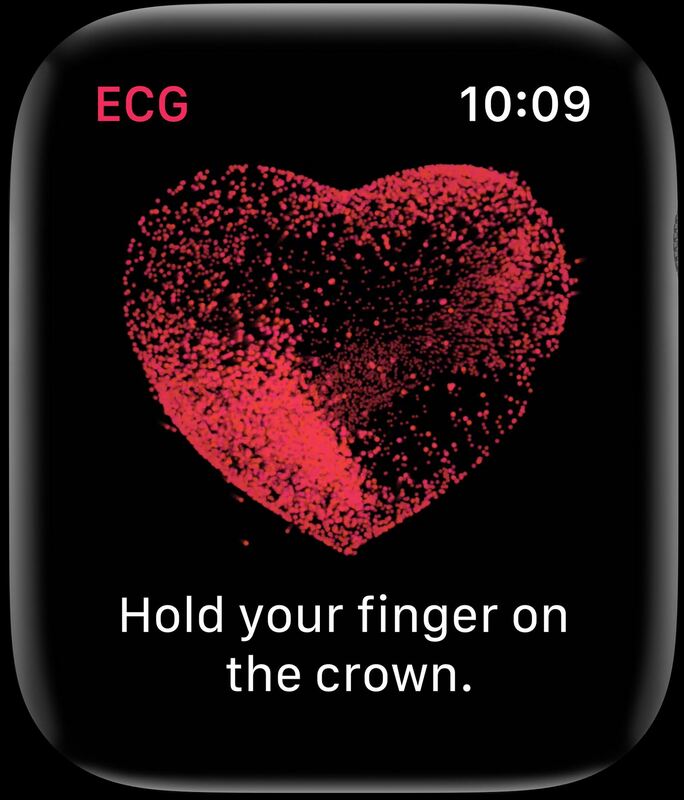 According to Apple's website the ECG app is coming later this year, so this functionality likely won't be enabled on launch day for the Series 4 Watch. Once that app becomes available it will store ECG results from all of the tests that you run, and at any point you can generate a printout of these results from the Health app to take to your doctor. The new Apple Watch will mark the first ECG sensor that has ever been made available over the counter to consumers. Alongside the ECG sensor, the new Apple Watch also ushers in advancements to its heart rate rhythm monitoring. The Series 4 will periodically sample your heart rate and send you a notification if it detects either an unusually low or an unusually high rhythm as compared to your current rate of activity. This behavior is also noted to be coming to watchOS later this year, so it won't be available right at launch either. The last new health-related feature of the Series 4 is fall detection. Apple has done significant research around the behavior of people as they fall in order to determine the difference between an unexpected fall and other forms of rapid activity. The new Apple Watch ships with a greatly improved accelerometer which is capable of sampling position eight times faster than the previous model. With this widened pool of data for each moment, Apple is able to track arm movements as you fall forward or slip backward in enough detail to determine a fall has occurred. When your Apple Watch thinks you've fallen it will tap you on the wrist with a notification. From that prompt you have the option to trigger the Watch's SOS feature and call emergency services, or confirm that you're okay (there may be other options as well, such as only contacting your emergency contacts, but Apple's marketing materials don't show all of them and it wasn't called out specifically in the keynote). If you do not press any options and you also remain immobile for 60 seconds, your Watch will automatically place a call to emergency services and send messages to your emergency contacts. The health improvements in Apple Watch Series 4 are by far its biggest features, and could have resounding impacts on the lives of many people. Apple has been working with the American Heart Association to verify the accuracy and functionality of their ECG monitor and heart rhythm alerts, and they have already received FDA approval on both of these features for public use. ECGs and rhythm monitors are some of the best ways to identify atrial fibrillation, or AFib, and it's a huge medical breakthrough to make such technologies so easily accessible to the public. If your Apple Watch does detect symptoms of AFib in your heart metrics, it will wait until it has detected six total occurrences before notifying you – which is a great decision to avoid panicking people with false positives. The Series 4 ships with two brand new new watch faces dubbed "Infograph" and "Infograph Modular." Each of these accommodates more complications than any previous watch face, and the complications themselves are new and improved as well. The image above shows some of the new designs for complications, which can be mixed and matched on the new Infograph faces. As far as I can tell, Apple is not planning on releasing these faces on older models of Apple Watch, but there were several other new faces announced today which will be backward compatible. The Breathe face shows one of three relaxing patterns and allows direct access to the Breathe app by tapping on the center of the face. It also optionally allows three complications, one in each top corner and one along the bottom. The Fire & Water face transitions back and forth between fire and water effects flowing out from the center to consume the entire face. This face allows the same three complications as Breathe, and can optionally be set to only display either the fire or the water effect (by default it will randomly choose between them each time your display turns on, or each time you tap the center). The new Liquid Metal face shows a full screen effect of liquid metal being swished around. 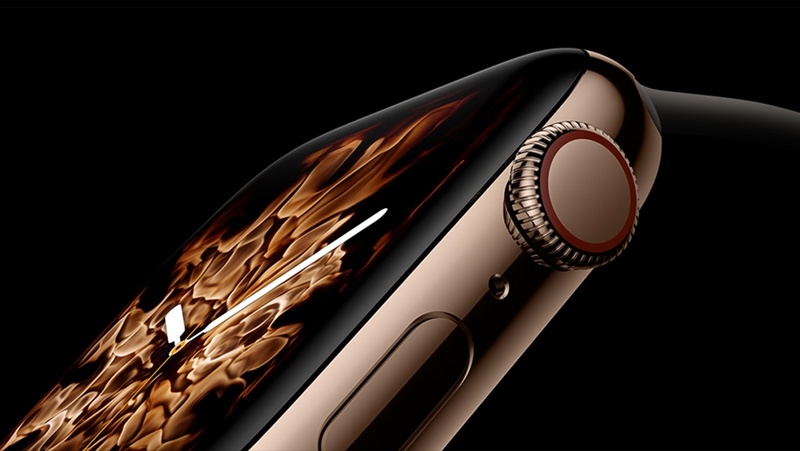 It optionally includes the same three complication styles as the previous two, and it can be set to silver, gold, or black metallic colors. You can also set it to all colors, which will cycle between the three each time you raise your wrist or each time you tap the center. Finally, the new Vapor watch face behaves in the exact same manner as Liquid Metal. The difference of course is that the effect shown is one of colored vapor floating around the display. The complication options are identical and you can pick between pink/orange, black/white, blue/green, or all colors. Each of the new effect faces are contained into a circle within the overall rectangle of older Apple Watch model screens. On the new Series 4 screen though the effects will flow all the way out to the nicely rounded corners. Overall these effect faces feel a little gimmicky to me, but I'm at least happy to see Apple allowing complications on every new face it adds. In the past many faces were forcibly kept "pristine" by disallowing complications, which of course massively limited those faces' actual functionality. The Infograph face is definitely the most interesting of the new bunch. It looks to be customizable to such a degree that it can look like an entirely different face based on what use cases you apply to it. One of Apple's examples on stage showed an Infograph variant which filled the center with shortcuts to contact friends. 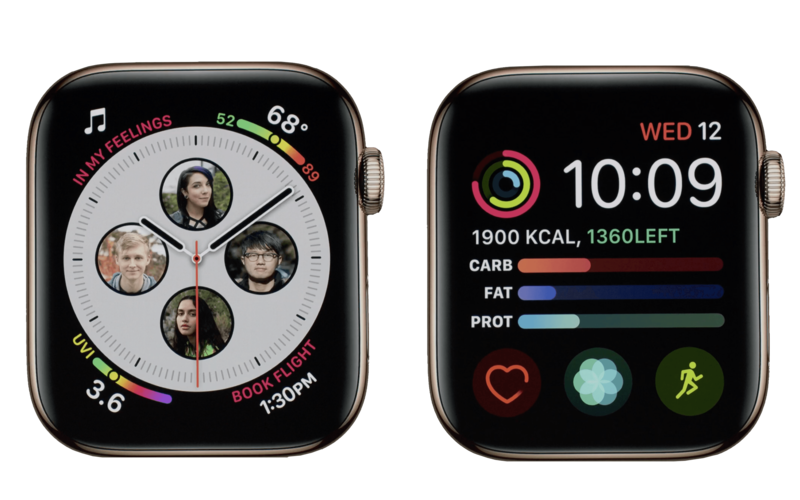 Another showed an Infograph Modular face entirely geared toward activity tracking, including a third-party complication running across the center with the day's carb, fat, and protein intake. I expect many people to find Infograph too busy to be useable at first, but since all complications are optional there may be some simpler configurations which display a decent amount of information without feeling excessive. We'll have to wait to get our hands on the Series 4 Watch before we find out for sure. If you purchase a Series 4 model from the Hermès or Nike+ collections, you'll have the option of new watch faces in a variety of colors and designs. Since I don't own an Hermès or Nike+ Apple Watch, I'm not sure whether the new faces are also going to be made available on previous models. The Apple Watch Series 4 is the first Watch to ship with Bluetooth 5, a protocol that iPhones began shipping with last year. In theory this should allow your Apple Watch to maintain its connection with your iPhone over a greater distance, and at greater data transfer speeds. Apple claims that the new Apple Watch models will have the exact same 18-hour "all-day" battery life that the Series 3 boasted. While working out, the battery life has been extended to 6 hours for outdoor workouts with full GPS tracking – 1 hour longer than the Series 3. If you also have cellular enabled then that time drops to 5 hours; add streaming music on top and you're down to 4 hours. That said, both of those reductions remain an hour higher than the corresponding Series 3 metrics. Apple has done some amazing work with the Apple Watch Series 4. The health tracking improvements alone mark an incredible upgrade over last year's models, and over the entire category of basic ECG monitoring devices (none of which are available over the counter). As this new technology spreads, hundreds of thousands of people will gain free, automatic access to advanced heart monitoring metrics. This is an amazing achievement and its potential impact cannot be overstated. Beyond health, the Series 4 Apple Watch has a beautiful new display in a similarly sized body. It's thinner and larger while maintaining the same weight as previous models, it improves cellular connectivity, boosts speaker volume and reduces microphone interference, and it includes a couple great new watch faces (and a few somewhat underwhelming ones too). There's no doubt that the Series 4 is the biggest Apple Watch upgrade to date. Unfortunately, it also comes with the first increase in base pricing for the device. The Apple Watch Series 3 is still being sold, and is holding down the bottom line at only $279 for the aluminum model with no cellular. That said, the Series 4 has a starting price of $399 for the 40mm aluminum model with no cellular – that's $50 higher than the $349 starting price of all previous 38mm flagship aluminum models. Upgrading to a 44mm model is only $30 higher now (starting price of $429), so at least that's slightly cheaper than the $50 increase similar size upgrades have cost in the past. I don't love the price increases, and I'm disappointed that Apple won't offer the stainless steel models without cellular. That said, these are still incredible new devices. The Series 4 Apple Watch is more worth upgrading than any iteration before it. With its new design, impressive speed improvements, and amazing heart monitoring benefits, this is clearly the best Apple Watch ever made. If you're still pushing a Series 2 or earlier, it's a trivial recommendation to go for the Series 4. If you purchased the Series 3 last year, the price increases may push these models too far away from being worthwhile. The Series 3 is still a great Watch, and its speed improvements over the Series 2 and earlier were already drastic. All things considered, Apple has given us an amazing upgrade this year. I'm excited to get my hands on a Series 4, and I'm happy to see the Apple Watch continuing to move forward at a rapid pace. There's still plenty more for this device to accomplish, but we're getting into the territory of it being a legitimate computer in its own right without relying quite so much on its iPhone companion.